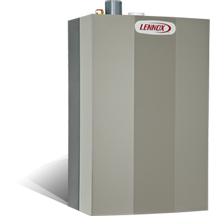 The Lennox GWM-IE gas-modulating condensing water boiler offered by Logical Heating and Air Conditioning is designed to maximize fuel savings. The GWM-IE boiler delivers up to 40% greater efficiency than conventional boilers. Its burner matches heating output to household demand, using only the energy necessary to keep you comfortable, which is ideal for Minnesota’s climate. ENERGY STAR® qualified—meets or exceeds EPA guidelines for energy efficiency, which means energy savings. Stainless steel, finned-tube heat exchanger design—converts waste energy into usable heat. Efficiency Rating (AFUE): Up to 95. Sealed combustion—minimizes fan noise and provides quiet, soothing heat. Modulating capability—allows burner to fire at a rate as low as 20% of its full capacity to perfectly match your comfort needs. Stainless steel, finned-tube heat exchanger design—is self-cleaning and extremely durable. Stainless steel mesh burner—provides greater resistance to corrosion and oxidation than aluminized steel burners. CPVC flue condensate collector—is corrosion resistant and eliminates the use of metal in venting area. 15-year limited warranty on heat exchanger. 10-year limited warranty on remaining covered components.